People showing erythema migrans, the characteristic skin rash associated with Lyme disease, can be diagnosed without the need for blood tests, NICE says in new guidance. Laboratory tests check for antibodies in the blood however Lyme disease antibodies may first appear six to eight weeks after a person has been bitten by a tick. Early laboratory tests may not detect the disease and could slow diagnosis. Erythema migrans is a skin rash associated specifically with Lyme disease and is present in approximately two-thirds of all cases. It is a spreading red rash that usually appears one to four weeks following a tick bite and can have a bull’s-eye like appearance. When there is no rash, lab tests can be used to guide a Lyme disease diagnosis, the guidance says. 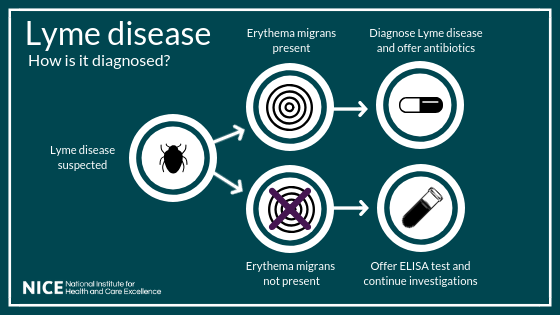 If the ELISA is positive or symptoms continue for 12 weeks or more, a more specific test called an immunoblot test should be used to confirm Lyme disease. Veronica Hughes, CEO, Caudwell LymeCo Charity, said: "I hope the new quality standard will increase the number of doctors who feel confident diagnosing a Lyme disease rash on sight and treating the infection right away. “Caudwell LymeCo Charity hears regularly from people whose doctors have diagnosed an erythema migrans but decide to check with a blood test, not realising that the rash is the more reliable of the two. Waiting for blood test results always delays treatment; when a patient has the rash, this delay is unnecessary and reduces the likelihood of total cure." This Lyme disease draft quality standard is out for consultation until the 12th March 2019.